Have no time for dusting? Tired of the build-up? We have you covered. 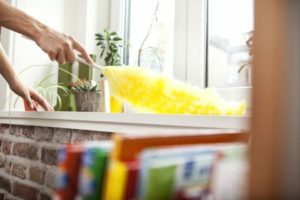 Whether you chose a deep clean or standard clean, we have dusting mastered. Here at Clean Arrival LLC, we will dust your home top to bottom. Busy lives, pet dander, kids, and regular life all lead to dust. It is inevitable in all homes and is often on the bottom of our lists of things to clean. We understand that everyone needs an extra set of hands at some point. Let us be yours. Stop doing all the dirty work. Free up your schedule and take time to enjoy living in your home instead of managing it. All our professional cleaners are provided with rigorous training in both quality service and customer relations. They treat each and every one of our customers as individuals and their homes with care and respect. Using commercial standard extension wands and dusters we will clear cobwebs and dust on ceilings up to 10ft high. Our recurring cleaning services features regular cobweb removal. Many people who use their ceiling fans regularly don’t realize just how much dust collects on them. Even as your fans are moving they collect a build up of dust. Once again using our commercial grade dusting extensions we will remove and dust collecting on fan surfaces. All our cleaning services include dusting of all accessible shelving surfaces. Using microfiber cloths to attract dust and debris we will tackle exposed shelves. Any area with numerous items is dusted delicately with a feather duster to remove debris gently without disturbing your personal items. Side table, coffee tables, and kitchen tables, they collect a lot of dirt, debris, and grim. By nature, they get a lot of traffic in our home. Our cleaning professionals not only remove the dust but also the debris and fingerprints.